Cafe World: Purchasing a Mystery Crate enters you to win $20! 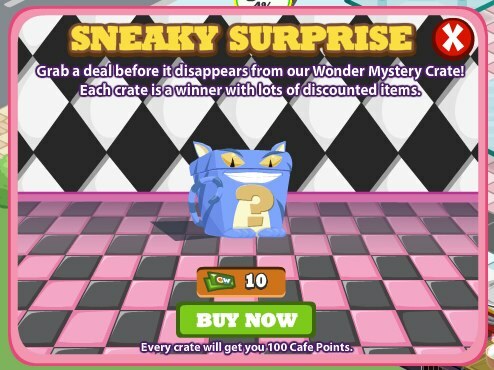 Zynga is working overtime this week, to make sure users know about the newest Wonderland themed Mystery Crate in Cafe World. They want users to buy them so much that they are willing to give away $100 in Cafe World gift cards to a group of users that do so. This setup comes in the form of an official contest. Until 11:59 PT tomorrow evening (Friday), all users that purchase a Mystery Crate will be entered to win one of five $20 Cafe World gift cards. While there's no guarantee that you'll be the lucky winner, even if you don't strike it big, you'll still have some discounted Wonderland items to use to decorate your Cafe. Is that enough of a reason to take a risk? We'll leave that up to you. Remember, the Mystery Crate is only 10 Cafe Cash, so if you do win, you will make a profit. Will you purchase a Mystery Crate in Cafe World for your chance at $20 of in-game currency? Let us know in the comments, and good luck to those that enter!